The real deal with Mobile web application development is testing it on multiple devices. So every one may not be able to buy all the mobile devices to test, especially with Android. Since we have many devices from multiple OEM’s and with different screen size, it’s not a feasible option to buy all devices and test. Thanks to Google for providing emulators to make our job easy! I have already wrote an article on testing mobile web applications in Android Emulator, but it’s initial version of Android device and it’s depreciated now. So, i thought writing extension to that with latest tools available from Google. 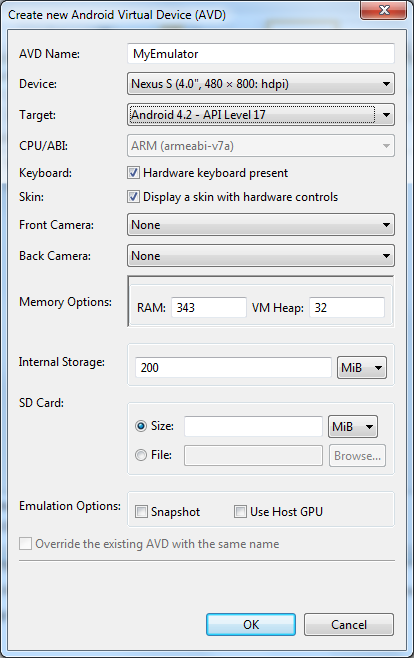 In this article, i will show you how to setup Android Emulator to test your mobile web applications on Windows OS [Since, more people looking for a solution on this platform ]. 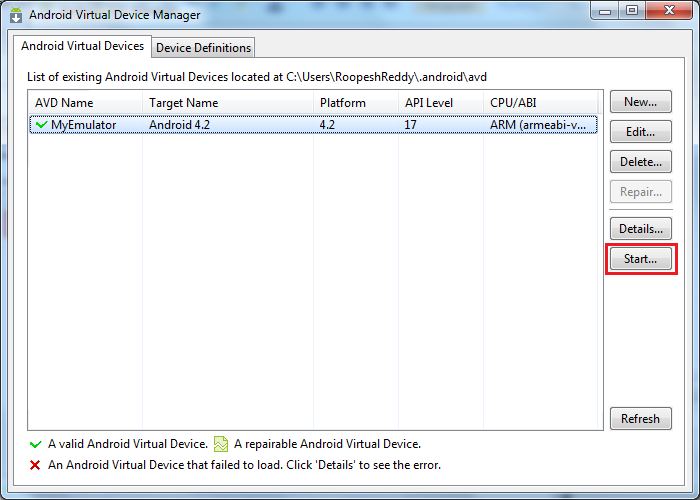 Download the Android SDK from this URL – Android SDK. NOTE: There may be change of page layout in future, but i hope Google allow to download the Android SDK. It gives you option to download x86 or x64 version. It’s up to you to choose the right version for you. NO CONSTRAINTS. The SDK contains all the required tools to get started with developing Android apps, anyway it’s out of topic. Once you are done downloading, unzip it. You will see two folders and SDK Manager.exe. 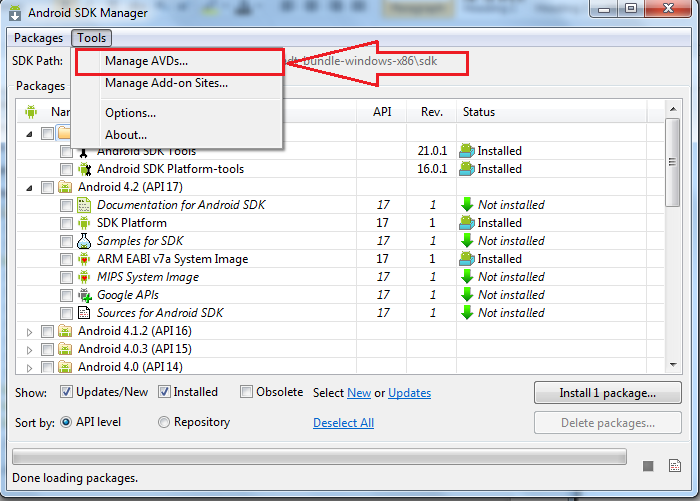 Click on the SDK Manager to launch. 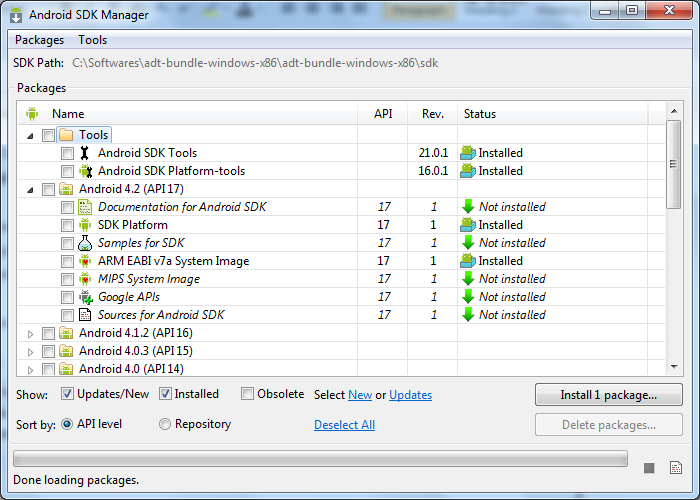 It launches the Android SDK Manager window. 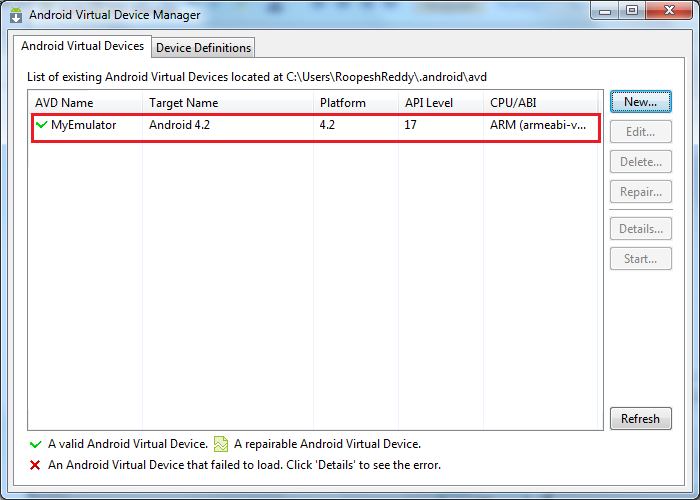 It launches Android Virtual Device Manager window. Now, we need to create a new Android Virtual Device, by clicking on New… button. 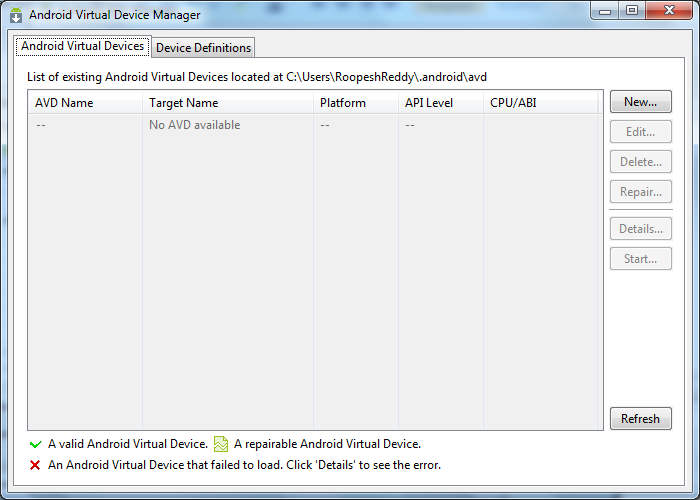 When you click on New… button, it launches Create New Android Virtual Device (AVD) window. Enter AVD Name, select Device and Target. In the Device dropdown, you will get all the devices with different screen sizes including Android Tablets. Target has the recent Android Version list, which you can select the required one. 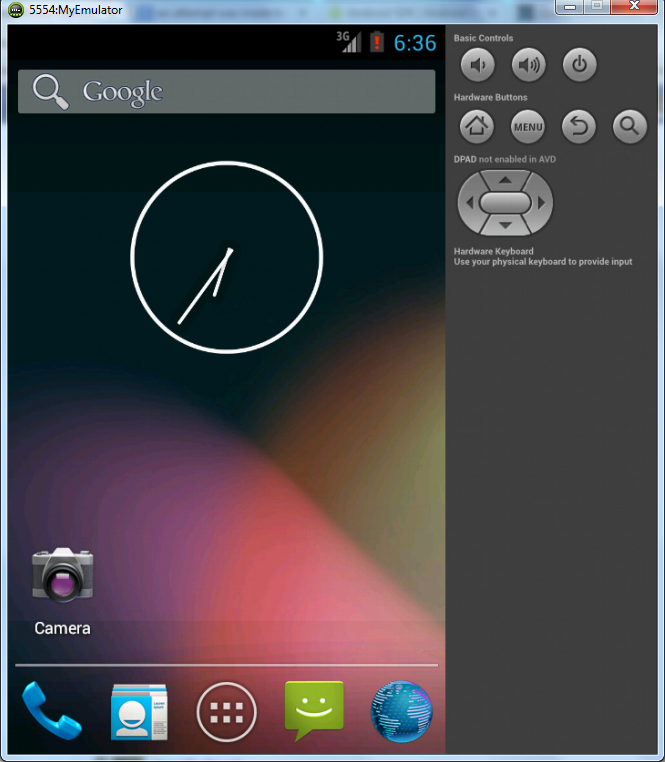 Now, we have Android 4.2 Jelly Bean. You can leave the rest of the fields to their defaults, which we are not going to mess up. If you wish to play around with other fields too, you are free to do that. Again NO CONSTRAINTS. On clicking on OK button, it shows message box, which summarizes the configuration of out emulator. Click OK button. 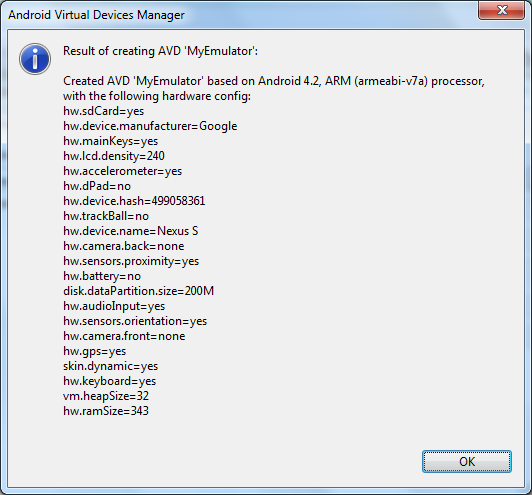 Now the newly configured Android emulator is added to the list. 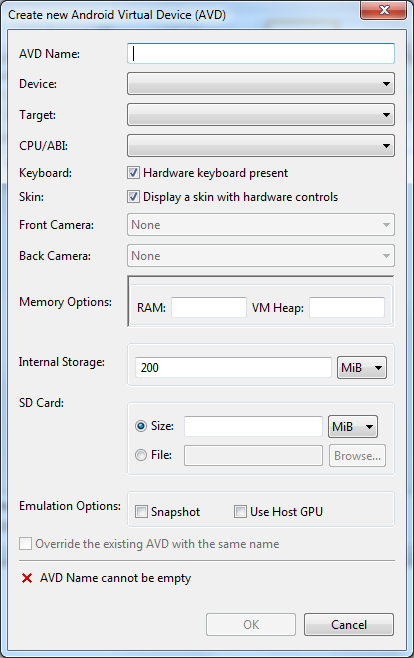 Now select the newly created emulator and click on Start… button. 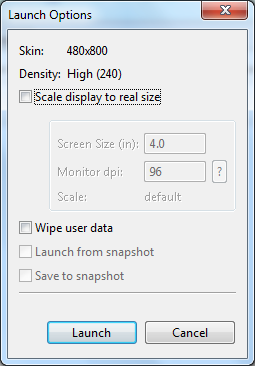 It will invoke Launch Options dialog. Now we are ready to test our mobile web application. Launch the web browser in the emulator and test your applications! NOTE: If you are testing your mobile web apps, that are deployed to local IIS, then you have to use IP Address instead of using localhost. Happy mobile web application programming and testing! I have seen many people asking questions in forums about Mobile web application development using ASP.NET WebForms. So i planned to write a blog post on the same. ASP.NET is a powerful web application development platform, allows to leverage most of the features in Mobile web application development. Now a days, mobile devices are capable of rendering HTML 5 content. Websites which works in desktop browser is rendering great in mobile browsers too. Mobile web browsing is rapidly increased and every one looking for ON THE GO solution! Now, the question is, Can we convert the existing web application to Mobile web application? Answer is YES. You can can do that. Just by adding the Viewport meta tag to the Head section of the webpage and you are done! Try the above code in a mobile browser and you will find the difference! Next question is, How do we create a separate version of Mobile web application? We can create stunning mobile specific web application using ASP.NET WebForms and when you access the web application from desktop browser it renders the general desktop web app and when you access it from Mobile browser it renders the mobile web app. How we need to redirect the user to the respective web app, when user access from different devices? I explained the same in one of my earlier blog post – Detect the device and redirect in ASP.NET. That’s one way of doing it. We have few more ways to do the same. CSS 3 Media Queries – Take advantage of CSS 3 media queries and you can redirect the users based on the requested device – MediaQueries. I feel it’s more elegant way. It’s up to you to choose the right method, based on the devices you are going to support! There are many mobile frameworks available, but the above mentioned are good and have great API’s to quickly design a mobile web application. Now comes the final part, Testing. Testing the mobile web application is real challenge. Everyone can’t afford to buy physical devices and test the web applications. Few device manufacturers provide Emulators, so that we use to test your web application. Check the below links, which i have blogged earlier related to testing the web application on Emulators! 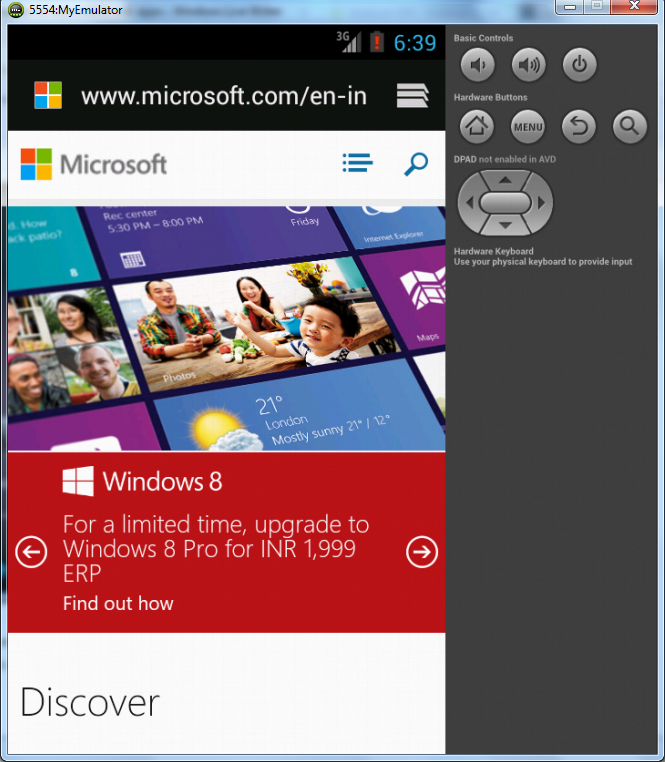 So, not least, ASP.NET Mobile website – Mobile. Great repository of information related to developing mobile web applications in ASP.NET and links to some cool tutorials. If you have any queries or doubts in developing Mobile web applications, do post your questions in Mobile and Handheld Devices Section in ASP.NET Forums. All time experts, great answers!